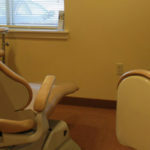 Dental Associates of West Michigan | Why Does Coffee Stain Your Teeth? Do you have a coffee habit? Most adults – and plenty of teens – rely on coffee to wake them up in the morning and give them the energy they need to tackle their work. Every day Americans drink 400 million cups of coffee, in fact. Coffee is effective as a stimulant, but it can have some drawbacks including staining your teeth. Why does coffee stain your teeth and what can you do about it? We’ll answer these questions here. Coffee stains for two reasons. The first is that the coffee contains chemical compounds called tannins that stain materials that will absorb them. 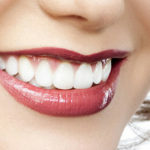 The second is that the enamel on your teeth, while very hard, is porous. It’s scored with pits and ridges that are vulnerable to penetration by tannins. When the two come together, stains occur. The more often you drink coffee, the darker your teeth will become. Some people have naturally white teeth and others naturally yellow teeth, but nearly everyone’s teeth are vulnerable to staining if they drink enough coffee, tea, soda, or red wine. Drinking coffee with creamer or milk in it or any other “lighter” version of coffee won’t prevent staining either as those same tannins are present even if in smaller amounts. Tea seems like a lighter beverage than coffee, certainly than black coffee, but tea contains both tannins and other compounds like theaflavins, thearubigins, and thebrownins which contribute to plaque buildup. Interestingly enough, green tea actually contains more tannins than black or white teas. How Can You Prevent Coffee Staining? The only way to prevent staining entirely is to give up beverages and foods that contain tannins or other staining compounds. Most people do not want to take such a drastic solution to this problem, though. The key, then, is to drink your coffee at certain periods during the day rather than continuously all day long. When you’ve finished your cup of tea or coffee, you should rinse out your mouth with water or brush your teeth to remove the tannins before your enamel can absorb them. Using a whitening toothpaste will also help. 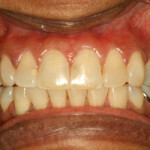 Scheduling regular cleanings with your dentist is another great way to remove surface staining from your teeth. We’ve talked before about options for whitening if your teeth are already stained and you do not like they color they are. Talk to your dental hygienist during your next dental visit and ask about what you can do at home or in the dentist’s office to get your teeth in tip top and very white shape. There are solutions. You do not have to resign yourself to giving up coffee or smiling with your mouth closed to hide your stained teeth from the world.